Cross the Rohtang La Pass and the landscape undergoes a vivid transformation, from valleys of lush green to mountains of different shades of brown, blending into high desert, suspended glaciers and blinding-white fields of snow. This dramatic and stunning setting of interlinked valleys is your introduction to Lahaul and Spiti, one of the most thinly inhabited places on the planet. Set amid barley fields, Lahaul (lovers of beer will be fascinated to know) supplies much of the hops to India’s breweries. More to the point, these twin river valleys offer excellent hiking opportunities, a fascinating contrast to the treks on the other side of Rohtang La. Legend says that Padmasambhava (better known as Guru Rinpoche), the Indian monk who converted Tibet to Buddhism in the 8th century, established some of the monasteries in Lahaul and Spiti. Indeed, it was Padmasambhava who introduced Buddhism to the region. Over the centuries, and despite the change of kingdoms, this Himachal district has maintained its cultural and spiritual connections with Tibet, until the latter was occupied by China in 1949. The district of Lahaul and Spiti is Himachal Pradesh’s largest. The valley of Lahaul is the divider between the Greater Himalayas and the Pir Panjal range – it is often known as the Chandra-Bhaga Valley, after its two rivers. 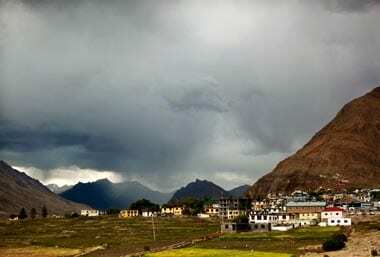 Isolated and bleak Spiti Valley, with its dry mountain-desert terrain, is encircled by soaring mountains with an average height of 14764ft (4500m). The climate here is markedly dissimilar to the rest of Himachal Pradesh. Due to a lack of rainfall, temperatures rarely cross 15C in the summer, while plunging to as low as -30C during winters. Hop on to a state bus from Manali, which will take you to Keylong (117km) and Darcha via the Rohtang Pass (open from late-June to late-October). Another option is to take a bus headed to Leh (across the Baralacha La and Tanglang La, mid-July to mid-September). In summer, private buses and shared jeeps also ply the Keylong-Manali route. Buses to Spiti from Manali are less regular; jeeps can be hired from Manali. The valley is entered from Lahaul via Kunzum La (14931ft, 4551m), open from July to October. 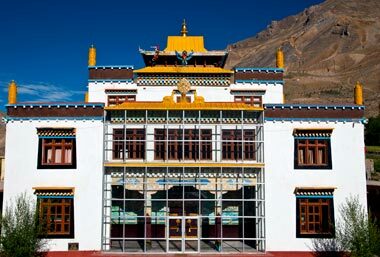 To reach Spiti from Lahaul, rent a jeep – or take a state bus from Grampoo through Kunzum La (80km), and then down towards the village of Losar, at the entrance of Spiti Valley. This is an awe-inspiring (if rather uncomfortable) journey.